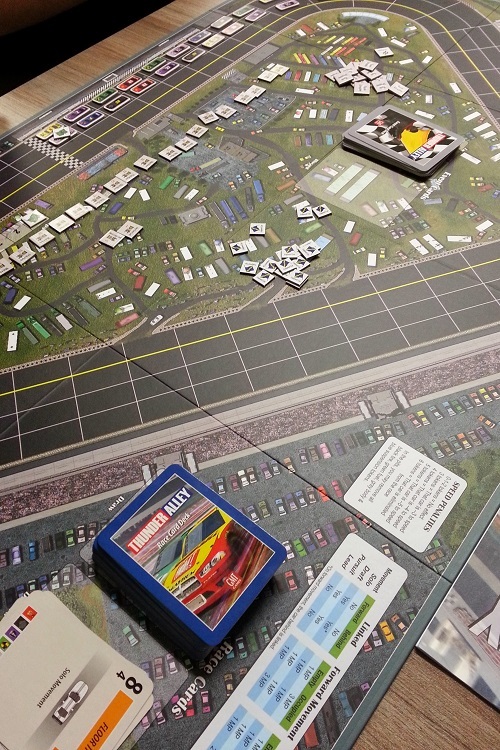 In Thunder Alley (GMT Games) by Jeff and Carla Horger, 2 to 7 players are competing in a NASCAR-style race to get their team of 3-6 cars to finish as high as possible. They will do this using cards to activate 1 of their cars and hopefully draft other cars along with them. Like any NASCAR events, the race can be stopped and restarted at times due to Yellow flags or the dreaded Red flags (too much rain, race is cancelled). As the cars are careening around the tracks they will take temporary and permanent damage, which might affect their performance or worse, take the car out of the race permanently. The only way to deal with the damage is to pit, but the timing of this is crucial: pit too early and it doesn’t make a difference and you’ve lost time, pit too late and you might just not finish the race. The game can be explained in about 15-20 minutes and, depending on the chosen track, a game will last anywhere between 1 hour and a half to 3 hours. I’m pretty sure that a 3 or 4 player game with experienced gamers could take as little as 1 hour. 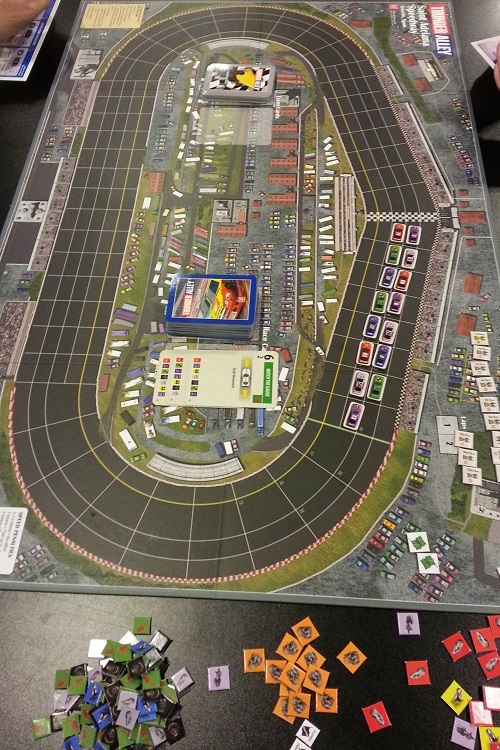 This is a first-class production from GMT Games: a very solid, deep 3 inch box with plenty of room for its two double-side race tracks (for a total of 4 tracks); 7 sets of 6 cars along with 7 crew mats; lots of damage tokens (both large and small); scoring token for end-of-race positions; two decks of cards (movement cards and event cards) as well as a well-written rule book. This is a very clean, crisp production and it shows that GMT thinks this is a genuine crossover game. No skimping here. Thunder Alley – a 7 player game! The rule book is fairly well organized and clearly written, which left very little questions during the first game. Plenty of examples also help make the game clearer. I do wish they had included better player aids in the box since it does take a little bit to get used to the difference between Draft, Leader and Pursuit movement. While the rules reminder on the race tracks help, they’re not very easy to use, especially when you have 7 people around the table. All in all a very good production. Lookie! instead of a long, boring written rules overview, here’s a video explanation! I love this game more than I should. As I’ve stated in the past, I have no interest in cars or car racing, to the point of not even having a driver’s license or having ever driven a real car. But, for some reason, I’ve played 3 times in the two weeks since getting a copy. Why? well, let’s just see what makes this a great game. Even with a full complement of 7 players, everyone is always involved in the game, simply because their cars might be moved by another player. 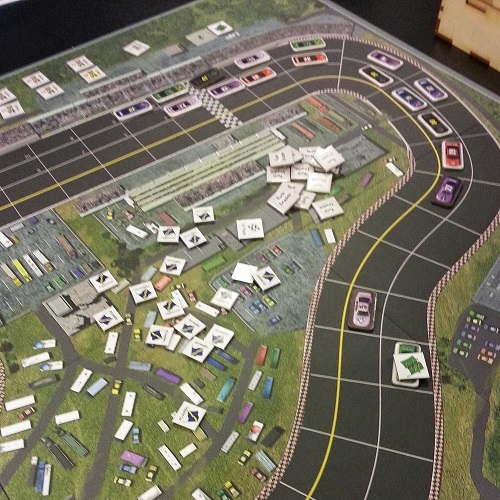 And while the game can be a little fiddly (moving all the cars that are drafted along with the active car can be slightly problematic when someone changes their mind), it is fun to move the cars and see how the packs move around. You do get a real sense of space and distance as you carefully consider what cars to move and how. While I’ve never really watched a NASCAR race, this is exactly what I see when I think of NASCAR. While pondering is useful and there can be a certain amount of Analysis Paralysis going on, it is something that is usually avoided. This is true even when playing with 5 to 7 players, since each player only has a hand of 4 cards and 3 cars to activate, with the amount of decisions dropping each time a car is activated. As the card phase progresses, the decision space gets from small to smaller, increasing the speed in which you can take a decision. Yes, there are many things that a car can do, but it must always go forward. This idea of momentum transfers well into the gameplay, as you can only hang on and hope for the best. There are those who would say, especially with the larger number of players, that you have very little space for planning since things will change so much by the time you get to play again, which makes the game devolves quickly into a tactical game, of what you need to do now to maximize your chances of winning and this might be true. On the other hand, this might just reflect racing very well since most of racing isn’t about long term planning but rather grabbing the chances as they come up and making the most out of them. I am looking forward to trying the game with a smaller complement of players and seeing how much more control there can be. With less players, you get more cars and thus more cards to choose from, and since you have more cars on the track, positioning becomes even more important. Maybe with a smaller amount of players the possibility of having a car lapsed increases, since I’ve yet to see that happen in the games I’ve played so far. Of course, the ever-present Yellow Flag has helped greatly since each time cars were lagging very far behind, a yellow flag event card came up. The Event deck is a very interesting beast. Not only does it force you to keep in mind the type of damage you take when playing a card (tip: spread the damage types as much as you can), but it contains 3 types of Flags which may change the face of the race. Yellow flags, and the dreaded Red flag can really change everything, with the Red being more of a game ender than a game changer… Keep in mind that there are only 26 cards in the deck, with 8 of them being Yellow flags and 2 Red flags. The longer the game (or the more complete hands being played), the more likely a Yellow flag will come up, or worse, the 2nd Red flag. Yellow flags are great when you’re lagging, or you have a lot of damage since the race is reset and taking a pit stop isn’t so punishing, but keep in mind that it’s also great for the other players! Thunder Alley – All lined up and ready to go! So what are you waiting for? Get in your car and race to the store!